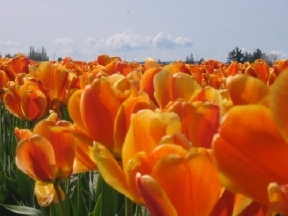 Going to the Seattle Tulip Festival? Make sure you're prepared for the weather! 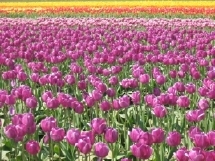 So if you know anything about flowers and flower shows, you should know that the Seattle tulip festival (which isn't really even located in Seattle), is one of the coolest places to see fields and fields of gorgeous tulips and other flowers. However, if you've been in Seattle for more than a couple of hours, you also know that the weather can change pretty quickly, going from cloudy to sunny and then back to cloudy, all in what seems like ten minutes. Normally if you're in the city, this isn't too much of a problem because you can make it from your hotel to the car to the local Starbucks without spending too much time sloshing through the mud. However, when you go check out the tulip festival, you'll want to remember what Seattle weather can do to a bunch of dirt fields. When we went to the Seattle Tulip Festival, we were lucky because the weather during the couple of days before we went was pretty good and it hadn't rained for a few days. However, when you go to the festival, you'll want to be sure you've got the right gear to go walking around dirt fields. If it has been raining the last few days, you'll want to make sure you wear boots or rain shoes because the last thing you want to do is spend the rest of your day walking around in the mud with sandals on, or slipping and falling and then having to walk around with a huge mud stain down your back. It's not very comfortable. Trust me, I've been there. You'll also want to think about throwing in an umbrella or a rain jacket if it looks like the weather might cloud up while you're there. This last time we went and saw the Skagit Valley Tulip Festival, we saw a lady there at one of the farms who was walking around in those type of VERY high heels with VERY pointy toes. Luckily the dirt wasn't too soft, but even then it looked like she was having a heck of time trying to make it through the fields of tulips. All it takes is for a little moisture from the sky and you've got problems if you're wearing those types of shoes. So just make sure you dress for the weather when going to the Seattle Tulip Festival. Back from the Seattle Tulip festival.